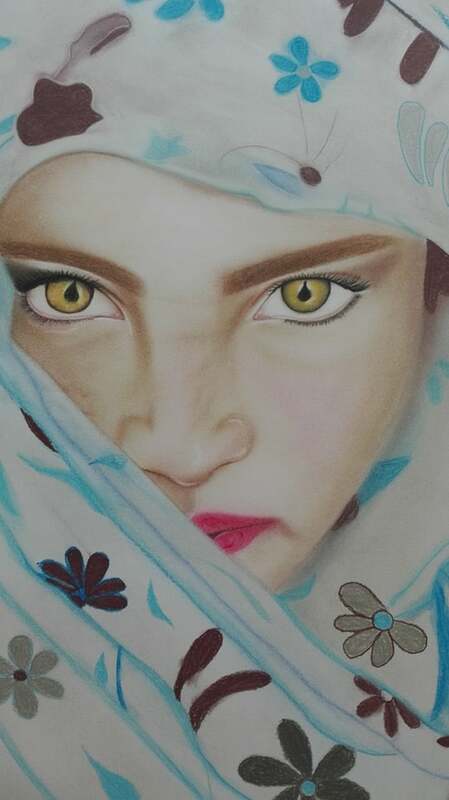 Shakiba is a 29 year old self-taught artist who is also a wife and mother to a nearly 2-year old son. Her family fled Afghanistan where they lived in a region controlled by the Taliban. Shakiba was 7 months pregnant when she made the arduous journey on foot through Afghanistan, and then by dinghy boat from Turkey to Greece. They have been living in a refugee camp since arriving in Greece nearly 2 years ago. Shakiba gave birth at the camp and her family has now been granted a three-year subsidiary protection in Greece. Although this is a desirable status, it also means that any assistance provided by the government (housing, food) has been withdrawn and the family must provide for themselves. Shakiba's art is emotional, raw, and conveys her experience as a refugee fleeing violence and danger in her country. Shakiba's current work is the first time she has shown her art to anyone other than her husband and immediate family. Her parents always told her that her art was "nonsense" and "useless." Her husband, however, supported her hobby and recognizes it for the true gift it is.